Friday, January 20, 2012 at 8 p.m. 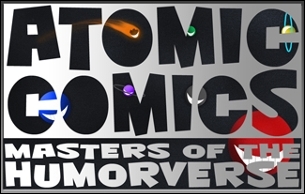 Announcing the very first “Atomic Comics” stand-up showcase extravaganza, a new series created by Nellie Huggins that features the best, most deserving (and socially active!!!!) comics in and around Chicago. The premier event will give Chicago’s discerning comedy fans a sneak peek at the national superstars of tomorrow while promoting literacy and youth education and supporting local youth programs. Sounds like a pretty good little Friday night! The show has partnered with Zealous Good and will accept donations of (all ages) books for both Barry Elementary School and St. Vincent de Paul Center. Every book donated will earn a raffle ticket for a prize giveaway. The show is 18+ and there are no drink minimums, though there is a bar and a restaurant (Act One) inside the theater. Tickets are $15, $20 for reserved seating, available here. Make sure to reserve your tickets online before they sell out and put aside a box at home or at work for any and all book donations! The cause is right on and the laughs are guaranteed. What better, easier way to jumpstart your year of living generously? Hop onto the event page on Facebook to keep up and don’t forget to bring your books, jokers. See you on the 20th!